Floating Hotels are nothing new, least of all in the Netherlands. But the SS Rotterdam is something special. As Amy Silver’s article in the current issue of Modern explains, this is not a simple matter of recycling a decommissioned marine vessel to produce a contemporary Hotel. 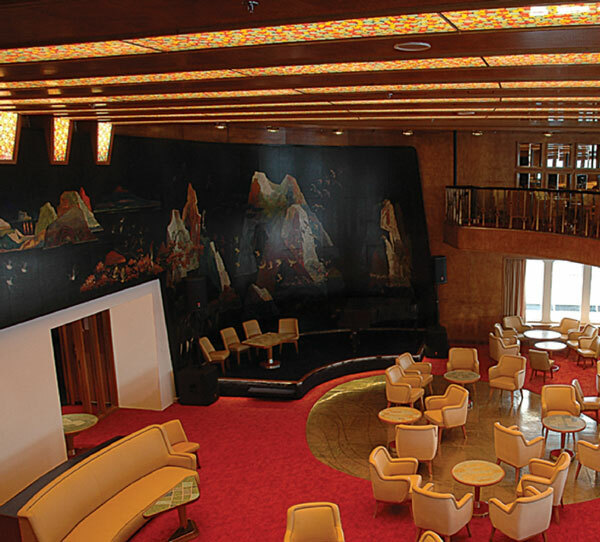 Built in the late 1950’s, the SS Rotterdam was the pride of the Holland America Line, the Netherlands’ largest marine fleet operating passenger and subsidiary services between Dutch cities and the United States. Now lovingly restored, it doubles as a floating museum to Dutch design culture of the period in addition to functioning as a hotel, restaurant, bar, conference and events centre. The SS Rotterdam captures the spirit of a very particular moment in European history. In fact, even the name of the vessel is significant, named after the city that was destroyed by the Luftwaffe’s bombs in 1940 and ironically endured further bombardments of the strategic port at the hands of the Allied Forces attempting to drive the occupying Germans out. Embodying the optimistic spirit of social and economic rebuilding in the post-war period, Rotterdam itself is the place in the Netherlands where the bright optimistic colours and curvaceous open lines that are so much in evidence on board are also in evidence throughout the city in contemporaneous buildings and design. In addition to the vessel’s distinctive funnel that postulated the smokestack as an open frame rather than a solid mass, she was as much noted for her distinctive interiors. A whole cavalcade of the top Dutch design talent of the day was commissioned to produce everything from the funky bars to the grand ballroom. In 2004, the campaign to restore the SS Rotterdam to her former glory began in earnest. Tireless effort and a cast of hundreds worked to match every material as closely as possible to its original design, to revive the past as accurately as possible whilst still being able to function effectively for the contemporary consumer. As one of Europe’s busiest ports, Rotterdam remains a frequent destination for many exacting business visitors. However, with the SS Rotterdam once again lowering her gangway to guests this year, one imagines that the city will attract even more design tourists, marine enthusiasts and visitors looking for something a little different. The SS Rotterdam is now permanently moored in riverside Rotterdam. The neighbouring area is at the centre of Rem Koolhaas’ master plan for the regeneration and expansion of the city to the banks opposite the city centre, conveniently connected over the wide navigable river by the elegant Erasmus Bridge. It’s an area that is rich in marine history and already boasts Hotel New York, the restored and re-designed nineteenth century quayside hotel run by the Holland America Line where travellers would stopover before embarking for the USA. Using a number of long narrow peninsulas jutting out into the river, it’s no surprise then that Koolhaas’ vision for the developments are inspired by Manhattan.